Ahoy! A pirate ship is about to unload a band of rowdy scallywags right into your backyard. Sure, you invited them, but that doesn’t mean they’re going to sit patiently and wait for a piece of cake. Perhaps some pirate party games are just what you need to keep them from pillaging the dessert table before you’re ready. The first thing you will need to play walk the plank is, of course, a plank. You can build your own by nailing a long plank of wood to smaller blocks of wood and standing it on the ground like a table (you only want the plank to be a few inches off of the ground, so use sturdy, but short blocks of wood). Once you have a plank, position it over a blue tarp or blanket to represent the ocean. Another fun idea is to place it over a baby pool. To play the game, line up your party guests and have them walk across the plank. The idea is to make it across without falling into the water. Any player who falls off of the plank is out. Players who cross the plank successfully must do it again—this time backward. Increase the difficulty each time, such as crossing sideways, on one foot, and while blindfolded. To play this game you will need several black balloons. Make a slip of paper for each balloon. On half of the papers write something indicating a winner, such as, “Collect Ye Treasure.” On the other half, write something referring to a loser, like, “Walk the Plank!” Fold the papers and insert them into the balloons before inflating. Scatter all of the balloons around the play area. Gather the pirates and tell them that they are under attack and must detonate the cannonballs before they reach their ship. Players will then stomp or sit on the balloons to pop them. A player who gets a winning message collects his prize and is out of the game. Players who get a losing message keep trying. The game continues until every pirate wins a treasure. At the start of the party, give each guest 10 gold coins. Choose a pirate word to be the forbidden word of the day. 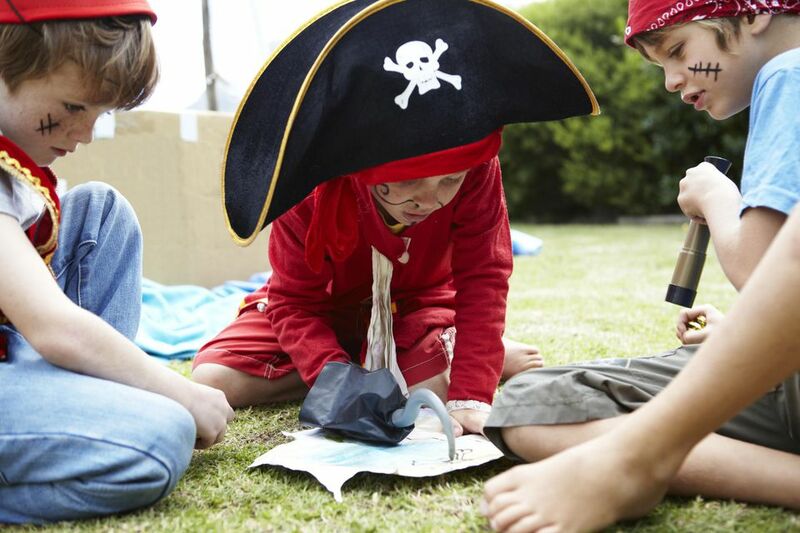 Since kids will be talking like pirates, some ideas for forbidden words include pirate, ship, matey, and arrrrrrrr. For the first 30 minutes, kids simply continue with the party activities as planned, but when one kid catches another saying the forbidden word, the offending player must surrender one of his coins to his captor. When time is up, the pirate with the most coins wins. This game is especially fun for fans of "Peter Pan" who will recall that Tick-Tock the crocodile swallowed Captain's Hook's hand, and has been hunting him ever since. Luckily for Hook, the croc also swallowed a ticking clock, so the Captain always hears him coming. Send one player out of the room. This player is Captain Hook. Set a ticking kitchen timer for two minutes and tie it to a stuffed crocodile. Have the rest of the players hide the ticking crocodile. Bring Captain Hook back into the room. If he can find the crocodile before the timer goes off, he wins a prize. If the timer goes off first, however, he is "eaten by the croc" and out of the game. Play enough rounds so that everyone has a turn to be Captain Hook. Gather your pirates in the backyard. Pair them up and have them stand face-to-face with their partners. Give a black water balloon to each set of pirates. Players that stand across from each other must toss the balloon back and forth until one of them drops it or breaks it, and is out of the game. The winning players from each pair then challenge each other, until only one player remains. To increase difficulty as the game progresses, you can have players take a step back after each toss, stand on one foot while playing, or try and play while blindfolded. With a large box, some craft paint, fabric for a flag and a few embellishments, kids can create and decorate their very own pirate ship. Once complete, this makes a great prop for not only pirate playtime but pirate photos as well. Fill two sandboxes with sand and then bury plenty of trinkets like fake jewels, gold coins, and stickers. Divide your pirates into two teams. Give each team a treasure chest (or bucket) and have them dig for the buried treasures. When time is up, empty the treasures and count the loot. The team with the most treasure wins. For this game, you’ll need two large cardboard boxes. Kids can decorate them to look like pirate ships if they want. Place the ships a couple of feet away from each other. Divide guests into two teams and have each one gather at a pirate ship. When you signal the start of the game, each pirate crew will bomb the other ship with cannonballs. You can purchase a lot of soft play balls, such as the kind used in ball pits, or you can make your own cannonballs out of things like crumpled up newspaper or aluminum foil. When time is up, count how many cannonballs are in each box. The team that landed the most in the opposing ship wins. This race is played like a three-legged race. Add pirate accessories to make it more exciting. Have two members from each team put on a pirate hat, vest, and eye patch and then race, with two of their legs tied together, to a pile of treasure. They must put as much treasure as they can into their hats and race back. When they return, they empty their hats into a large treasure chest and hand off the accessories to next set of players. The first team to fill their treasure chest wins. To play this game you will need two toy pirate ships and a baby pool. Fill the pool with water and place the ships on one side of the ship. Players must blow their ships across the pool. The first ship to reach the other side wins. If the ships don’t float well, you can place them on small rafts. Another idea for pirate ship racing is to build two pirate ships out of cardboard boxes. Divide guests into two teams. Have one player from each team sit inside of the pirate ship. Another player from each team must push their teammate, in the ship, around an obstacle course and back. The players then switch off to the next set of pirates from their team. The race continues in this relay-style until one team has had all of their players complete the course. For this game, each team will need a pirate hook. The first player for each team wears the hook and runs to a pile of chocolate-coin-filled mesh bags. Players must hook the bags and bring them back to their teams. The remaining players in line must also put on the hook and do the same. The first team to retrieve all of their coins wins. Divide players into two teams and have them stand on either side of a volleyball net (or imaginary line). Give each team a bucket of black water balloons and a large sheet or beach towel (you can even paint pirate flags on them). The serving team places their balloons in their flag and launches them over the net. The opposing team tries to catch them and volley them back. Play continues, switching serving sides until everyone is wet and laughing.